TIW, a unique product for small transformers. 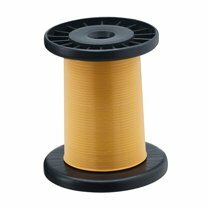 Three layer extruded coatings of high performance polymer resins gives excellent dielectric properties to this type of winding wires. Unlike enamelled wires, three layers of insulation are extruded over the copper conductor by an automated manufacturing process ensure perfect central position of conductor. The conventional enamelled wire winding coils requires insulation between the primary and secondary coils by means of barrier tape or interlayer tape, to isolate primary and secondary windings. Since three layers coating is having very high dielectric strength, it has very less creepage factor. This positive feature of TIW serves to downsize switching transformers, and promises high production efficiency and cost reduction. Depending on the design, the transformer size can be reduced up to 40% and weight up to 60% as compared to transformers made up of enamelled wires. Their applications cover most switching transformers, information and telecommunications equipment, game machines, consumer goods, inverters and other similar devices.